I’ve gone back in forth on not only writing this post, but also on how best to write this post. The topic of weight is something I often come back to as a blogger, as it has been a central part of my life, my entire life. It’s not an easy topic, but I also feel like the topic of weight isn’t openly discussed the way it could be, despite how vast the diet industry is. There are some aspects of weight that in my opinion deserve to be talked about, and one of those areas is around gaining weight during pregnancy. Prior to my first pregnancy I worked really hard to lose some of my excess weight. I wanted to reach my healthiest weight before having kids, but after months and months and months of putting off pregnancy for weight loss, I had the realization that I couldn’t keep putting off pregnancy for a weight that may take years for me to reach (or I may never reach). 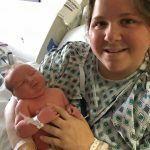 At 234 pounds, I found out I was pregnant with my first and prayed that my body was strong enough to support a healthy pregnancy. Looking back, no matter what the scale had said before my first pregnancy, I was in really great shape! I was so overly focused on the number on the scale because it had been ingrained in me that an obese pregnancy was an unhealthy pregnancy. I truly believed that my weight would automatically put a child at risk and thus I continued to put off pregnancy in order to reach a magical number on a BMI chart that a doctor would deem as healthy. What I had to learn quickly is that the body is amazing and capable of so much more than we can imagine. Number on the scale aside, I quickly learned that many other variables impact pregnancy and the most important thing is to find a doctor who understands you, your health, and how best to coach/support you through your pregnancy. Now, as an obese women, I have to say that gaining weight for pregnancy is hard. It’s hard physically in some ways, but it’s really hard mentally. 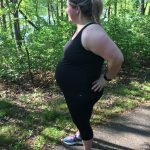 Getting myself to stop obsessing over weight loss prior to pregnancy was a challenge, but shifting my mindset towards healthy weight gain was a completely different endeavor during my first pregnancy. I’ve never, ever known healthy weight gain and had to really work through the notion of seeing the scale go up for a positive reason. During my first pregnancy, I was really consumed with my weekly weight. I weighed myself religiously, tracking my weight throughout my pregnancy, and living fearfully about gaining more than recommended. 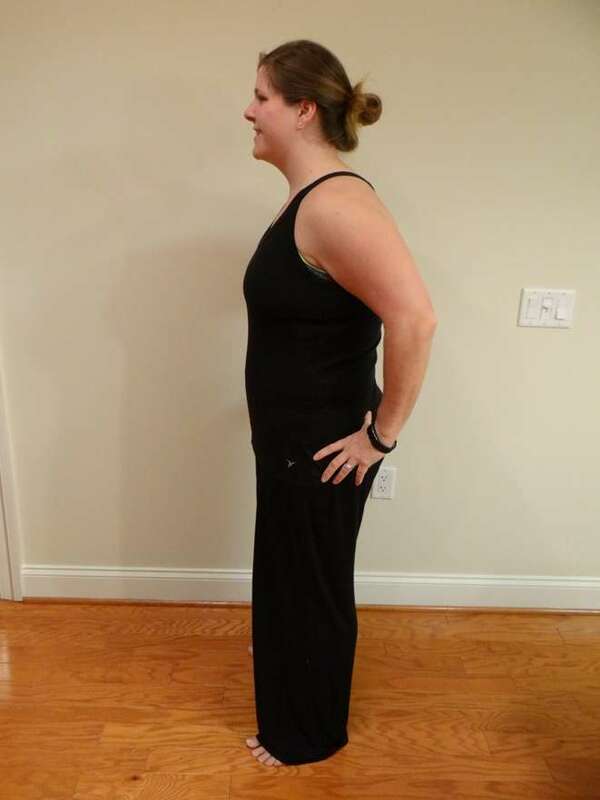 Although my doctors recommended a weight gain of 30 pounds, 15 pounds more than what I had read in books, I was still scared of how my weight gain would be perceived by doctors and how it would impact my daughter’s health. 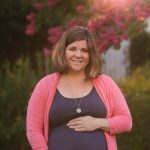 What I learned quickly is that at times, there is little you can control within your pregnancy – hello first trimester! When you can control things, all you can do is your best! 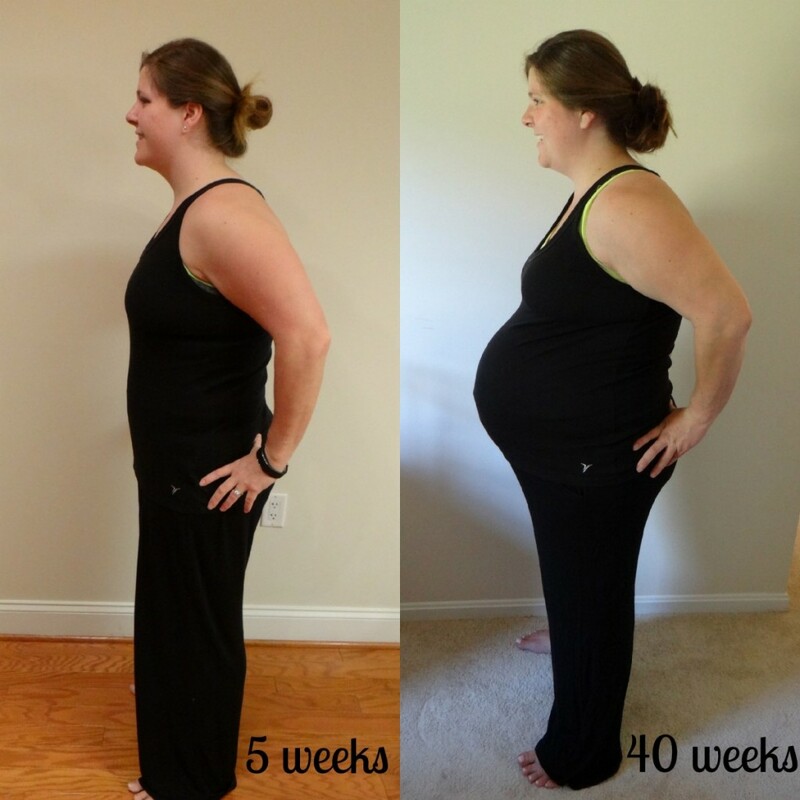 During my first pregnancy I tried to manage what I ate and took spin classes until I was 40 weeks pregnant. Regardless of my weight gain, I knew that I had done the best I could and that my weight gain was necessary for growing our daughter. 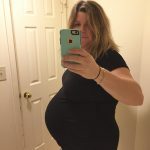 As I move closer to our 32nd week of our second pregnancy, I have a completely different outlook on gaining weight during pregnancy the second time around. Well, maybe not completely different, but ladies, we are too damn hard on ourselves. In the first trimester, you’re going to feel horrible. If a bagel helps you to feel better, eat the bagel. If a jar of pickles helps you to feel better, eat the pickles! As you move into the second trimester, you’ll feel so much more like yourself, but just because you’re pregnant doesn’t mean you need to eat for two. This one is hard because guess what, you’re going to have weird and fun cravings. You’re going to love food and you’re going to want to eat. Don’t be crazy, don’t be restrictive, but also don’t go buckwild. And if you do, move on. 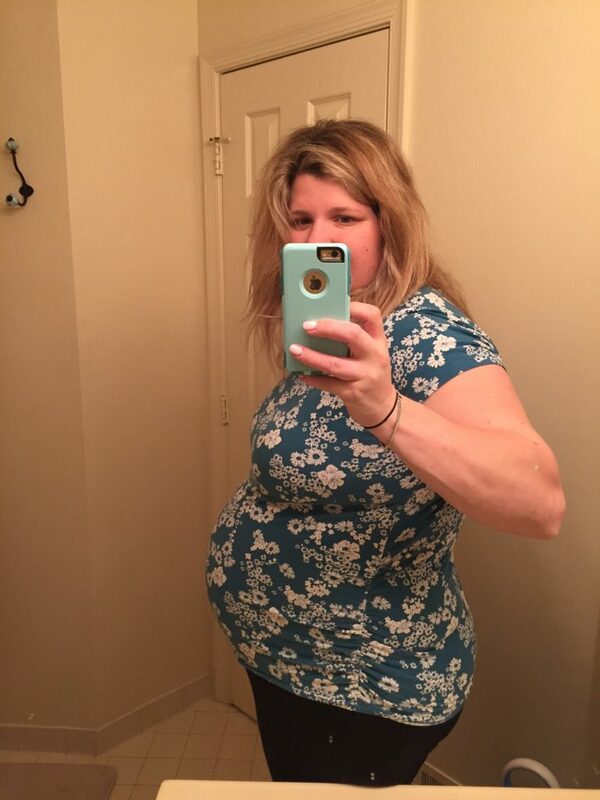 For me, this pregnancy, veggies have been the furthest thing from my mind. I’ve had to work to eat veggies each day. I’d be happy as a clam eating bread, eggs, ice cream, cookies, and any form of Mexican food each day and not touching veggies. The second trimester is the perfect time to get back on track IF you’re feeling better. I totally recognize that many women don’t feel great in the second trimester either. Either way, be kind to yourself. The third trimester is tough. I’m not going to lie. 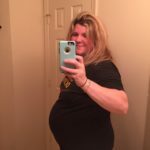 You’re going to be tired, uncomfortable, crazy emotional, irritable, incredibly hungry (especially at the end of your pregnancy), and you’re patience is going to go out the window. You’re going to seek comfort and calories, all of which a brownie can provide you. Trust me, be kind to yourself. Find ways to care for yourself outside of food intake, but also be kind to yourself when you do eat a sweet treat or give into a craving. You’ve been growing a BABY and trust me, you’re not going to sleep much, let alone remember to eat, once that baby arrives. My second pregnancy has further confirmed my belief that the body is amazing, that we must focus on the things we can control, and that regardless of your starting weight, you can gain just what is necessary for your pregnancy. It is REALLY easy to gain too much weight, so I won’t deny the need to be careful, to obviously follow your doctor’s instructions, and to watch your diet throughout pregnancy. I am grateful for two healthy obese pregnancies, both of which I attribute to working out religiously when I’ve felt good, trying to limit sweets and treats, and just being kind to myself. Gaining weight during pregnancy is difficult mentally, especially during a first pregnancy, but through a healthy focus, an understanding of what you can control and what you can’t, and a perspective towards how short pregnancy is big picture, I truly believe women can overcome the mental struggle with gaining weight during pregnancy. Seeing the number on the scale go up each month is hard and I won’t deny the cringe I felt when I stepped on the scale last week, but I’m feeling great, I’m still rocking my 5 AM OrangeTheory workouts, and I’m eating as best I can. Everything else, aside from sleep and my own stress management, is in someone else’s hands.